ACER Philippines – ACER Iconia Smart S300, you will ask yourself if this is a mini tab or a smartphone once you hold it into your own palm. Before the end of this year’s second quarter, ACER launched and showcased all their new and incoming products – smartphones, notebooks, tablets, projectors, etc. And not too long ago I posted two of my favorite ACER Iconia gadgets – their buttonless notebookand their new tablet collections. Let us now look and check out their smartphone – meet ACER Iconia Smart S300. This phone is powered by Android OS version 2.3 also known as Gingerbread. And as everybody says “Iconia Smart S300 gives users the best in panoramic perspective”. Why? Imagine yourself holding a phone powered by LED TV technology, sounds familiar isn’t it? And imagine yourself holding a mobile phone that is fully loaded with tablet features and capabilities. This smartphone is fully loaded. Most smartphones’ trend are now going away with the conventional QWERTY keys and they’re moving to button-less touch-screen – which I think is the idea of all Iconia gadgets so far. Acer Iconia Smart S300’s display is a 4.8 inch touch-screen with a total dimensions of 141.7 x 64.5 x 13.6 mm and weighs 185 grams – gigantic for a phone. It also have an 8mp camera on the back as well as a smaller one on its front which you can use for your video calls. 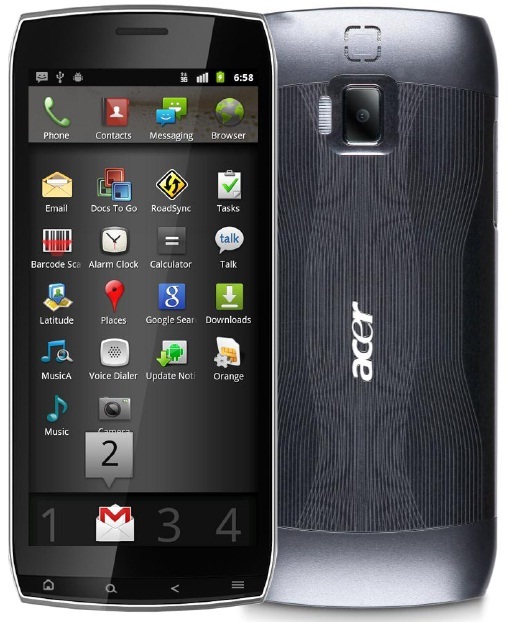 This is also an Android phone equipped with Google’s Android 2.3 Gingerbread OS with UI enhancements from ACER itself. The phone comes also with seven different home screens that you can actually customize depending on your needs or how you want your home screen to look like. Powered by a 1GHz Qualcomm MSM8255-1 Snapdragon Scorpion processor makes it capable to provide you a decent graphic and quite pretty quick. And before I forget, you can also watch your favorite movies or listen to your favorite music and actually enjoy its Dolby sounds quality. I haven’t seen any retailers that offers this smartphone as of writing this article but rumor says that it will come out with at most PhP 25,000.